As a longtime and loyal fan of the Texas Chainsaw Massacre franchise, I waited with baited breath for this low budget horror film that looked like a pure callback to the horrific elements that made the original such a frightening feature. Considering this year's Leatherface prequel was such a MASSIVE letdown, there was the slight hope that this indie film might be the second calling we all needed. Could chainsaws and human flesh eating be fun again? The trailers and promotion were made to look like this would be a near perfect tribute to skin masked killer and the cannibalistic family that's scared us for decades. Escape from Cannibal Farm or Cannibal Farm (as it's being called in the U.S.), looked to deliver something the last couple official sequels and prequels couldn't. From the marketing campaign, it seemed like it would be a gritty new spin on the tropes that we've come to know and love, but would also reignite some fear in a fanbase that's been eager to feast on more chainsaw wielding havoc. Sadly, this movie falters in many aspects. Starting off with a plot line that literally cops the opening moments of The Hills Have Eyes and its excellent remake, Cannibal Farm quickly spins out of control into not just paying tribute to some of its predecessors, but becoming way too apparent with it's nonstop homage. A family goes on a trip to try and reconnect. Their RV is under attack and suddenly they're the victims of a human flesh eating family that lives in the middle of nowhere. I'm not really spoiling anything here, because we've seen this time and time again. 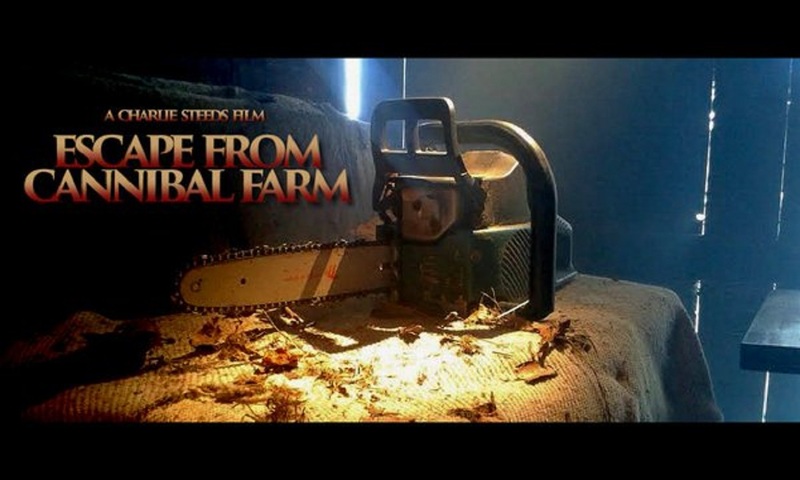 Having been so eager to get my eyes on this movie as soon as possible, it was abundantly clear within minutes that something was amiss down on the farm. Cannibal Farm needed a full script rewrite before ever committing anything in front of a camera. The movie is all over the place, introducing sub-stories and completely unnecessary plot lines that simply do not need to be here. Where successful horror typically finds its legs is within the realm of creating realistic and terrifying moments of tension that hinge upon great graphics and effects work. When realistic gore is thrown into the mix with a vile antagonist that lives and breathes torture and pain, fans typically find something to attach themselves to. In Cannibal Farm, there is no grit. There is no suspense. The kills are extremely unoriginal. The deaths are never frightening. And the way the super thin story plays out is totally nonsensical. Nothing makes any sense. Plus, the brand new 'Leatherface' type killer has such a silly back story that most die hard horror viewers are going to laugh themselves to death at how inane this project is in some specific areas. Using an extremely cheap looking style that feels more like a British TV show that it does guttural horror, this is amateur film making at its best that will require a large dose of patience to get through. After waiting for so long with a great amount of anticipation, this doesn't really qualify as the movie it's been touted to be. I really wanted to like this. Unfortunately, I didn't. Yet, someone else might find the good that I failed to see. It's never fun and it doesn't ever feel good to give a project like this a negative review. Charlie Steeds deserves credit for trying his hand at this kind of horror. Positively, he gave it his all. It just didn't sit right with me.